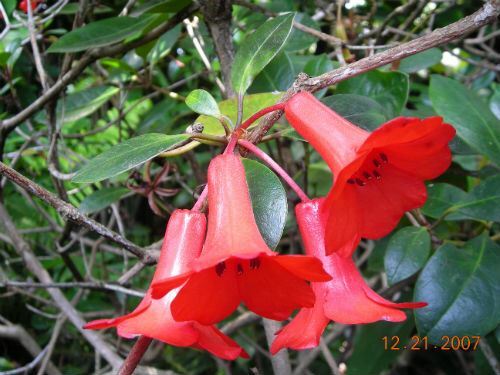 To grow Rhododendron lochiae successfully, you will need a raised bed with moist, acid soil with a high organic content to mimic their natural high mountain north Queensland rainforest conditions. I planted mine about 25 years ago in my garden (in the northern Sydney suburb of Westleigh) and they are now approximately one metre high and about the same wide -- yes they are slow growing. They receive only dappled morning sun and shade for the rest of the day. My plants are happier with some supplementary watering as they flower better and after good soaking rains I am rewarded with a mass display of flowers from late spring through to autumn. The flowers are about 50mm long by 30mm across and occur in terminal clusters of up to six flowers, although the best my plants can do is four flowers. Perhaps my growing conditions are not ideal. Rhododendron: is from the Greek rhodon, rose and dendron, tree, in reference to the terminal flower clusters. lochiae: named by Ferdinand Mueller after Lady Loch who was the wife of Sir Henry Brougham Loch, who was Governor of Victoria 1884-89.